Baseball and cricket are closely related sports, both historically and in the range of skills required. It is therefore not too surprising that the Frankston Baseball Club originated from the desire of members of the Frankston Cricket Club (est. 1880) to improve their cricketing skills by establishing a baseball club. Baseball was played in Victoria as far back as 1856, the participants being Americans, who had migrated here in the rush for gold. The game really began in Australia after A.G. Spalding's 'All Americas' tour of December 1888. The Victorian Baseball League was formed in 1880 with mainly metropolitan clubs as members. In 1931 the Dandenong Baseball Association was established and the Victorian Provincial Baseball League was formed at a meeting in Ballarat in 1938. The 40's was a decade of extreme disruption throughout the world - even those few nations fortunate enough not to be involved in the global conflict could not escape its secondary effects of food and material shortages as traditional supplies dried up. In Australia, it was a time of grave fear as our troops served overseas. Yet Australia remained 'the lucky country', for no invaders landed. Re-building of the nation commenced in the post-war part of the decade despite industrial unrest, immigration concerns, and the introduction of the 40 hour working week. Frankston was booming: land was cheap and workers could commute to the new manufacturing areas, especially near Dandenong, while living near the sea. The electric train to Frankston gave the town a major advantage over other parts of the Peninsula served by the far slower, and dirtier, steam trains. As a result of an increase in families, created by record birth rates, Frankston became a favourite suburb for young families desperately wanting suitable housing. As would be expected, pioneering a new sport on the Peninsula was not an easy task for Club officials. Enthusiasm was high but many players were inexperienced in the rudiments of the game. It therefore took some time for the experienced players to 'show the way' to the many youngsters keen to play competitive baseball. Prior to the inaugural meeting, the Club had successfully applied to be admitted to the Victorian Baseball Association competition. As a newcomer to baseball, the Club was included in 'G' Grade and competed against such clubs as Williamstown, Port Melbourne, Hawthorn, Newport and Prestige. The first practice match was held on 7 April at the Cranbourne Road Reserve against Footscray Technical School Old Boys team. Despite lack of match practice and the fact that FTSOB were a far more experienced team, Frankston did well to score five runs against the opposition's fourteen. The opening match of the 1945 season was not a successful one for the newly-formed Frankston Club. They were soundly defeated by the highly-experienced Epiphany club at Northcote. Keith Lovitt, Captain/Coach of the team, was nevertheless very pleased with the performances of some of the younger members of the team. History was made on Saturday, 28 April, 1945, when the Cranbourne Road Reserve was the scene of the first competitive baseball game in the Victorian Baseball Association Series. Frankston played Hawthorn in a fast match which resulted in a win for Hawthorn by ten runs to three. Except for a breakaway in Hawthorn's fourth innings, which resulted in six runs, the youthful Frankston side made a very good match for the winners. During the first season the Club struggled to compete against far more experienced teams. However, players were becoming attracted to the game and a foundation was laid for future development. Players who 'pioneered' the first foray of the Club into competitive baseball included the following: G. Aitken, B. Burnham, B. Gray, F. Gregory, T. Hamilton, B. Johnson, E. Johnson, R. Johnson, K. Leyshan, K. Lovitt, F. McLean, J. Morris, L. Pratt, E. Siggins, F. Sloane, W. Talbot, H. Tickle, N .Tindall, T. Trewartha, N.V.T. Williams, B. Wood and Messrs Barclay, McPherson, Newell & Phillips. It is interesting to note that the 'Rudiments of Baseball' were published in the 5 April, 1945 edition of 'The Standard' in order to familiarise readers with the basic essentials of the game. As a new sport on the Peninsula, 'The Standard's' coverage was on a weekly basis with reports and results of matches, along with best players and outstanding plays. In addition, Radio Station 3DB broadcast the results of the main games. A special 'Sports Parade' was put over by 3KZ every Friday evening which covered the highlights of games from the previous week. As a result of Frankston's geographic location, the Executive of the Victorian Baseball Association provided financial assistance to clubs and umpires making the trip to Frankston's home ground - ten shillings for a club and two shillings and sixpence for each umpire! In an endeavour to have a headquarters for baseball, the Victorian Baseball Association arranged for the use of Olympic Park for eight Saturdays during the 1945 season. Such a decision proved a disaster as only the receipts from the final round enabled the accounts to be balanced! The Dandenong Baseball Association resumed operations in 1946 after being in recess for four years because of the Second World War. The teams that made up the Association that year were Dandenong, St James (later to become Saints), Dandenong Imperials, Springvale, Oakleigh, Ormond Park, and Frankston. 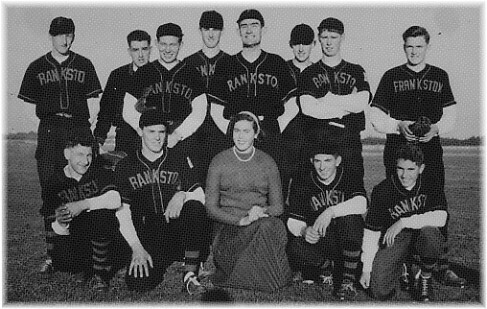 Frankston's entry into the Dandenong Baseball Association in 1946 proved to be a successful one. Their first match in their new competition was played at Dandenong on 4 May, 1946 and resulted in a 15/1 win against St James. The first match at the Cranbourne Road ground took place the following week - 11 May, 1946 - against Springvale. Players who played in that team included I. Bowes, E. Hamilton, R. Johnson, R. Lockwood, K. Lovitt (C), M. Morgan, F. Morris, Major V. Rowe and V. Smale . The following week saw the team record a 12/8 win against Dandenong Imps - a team that always provided tough opposition to Frankston teams of that era. As the team developed in team skills, experience and confidence it soon became very competitive. Wins were recorded against far more experienced teams and enthusiasm within the Club increased dramatically. On Saturday, 17 May 1947, Frankston scored a huge win over Presbyterian at Dandenong - 42/1 - at that time a record score in any one match in the Association. Further improvement resulted in the team contesting the 1947 finals. The first semi-final played against Oakleigh resulted in a 6/3 win for the Frankston team, despite two runs being scored by Oakleigh in the 7th innings. Frankston responded with a further two runs and another in the 8th to clinch the game. Safe hits were recorded by J. O'Brien (3), K. Lovitt, J. Smale, C. Curwood, J. Bowes, V. Rowe, L. Lockwood (2) L. Eggleston and E. Johnson (1). In the preliminary final against Springvale, Frankston was considered unlucky to lose as a line drive was narrowly missed at left field resulting in 3 runs. In the final innings Frankston left runners on bases and Springvale eventually won 4/1. The Imperials defeated Springvale 11/4 the following week in the grand final. The 1948 season resulted in Frankston once again reaching the finals after completing some outstanding victories, in particular a 37/0 result against Oakleigh Golds. In a spectacular semi-final game against the Imps, scores were tied at 5 all in the 9th innings. Despite outstanding pitching and inspiration from Frankston's captain, Clarrie Curwood, the Imperials scored the necessary run in the 11th innings to win the match 6/5. In the all-important area of administration, the Club was indeed fortunate in having two members of the O'Brien Family in executive positions. William was President from 1948-55, whilst John, his son, was Secretary from 1948 until 1961. John's administrative skills proved to be invaluable in attending to the wide range of issues faced by a club in its early stages of development. In the late 40's, Club membership for senior players was ten shillings ($1.00), whilst juniors paid five shillings (50c). In March 1948, the Club's bank balance was 11 pounds ($22.00). As more players became attracted to the game, the overall strength of the Club increased. The acquisition of some fine players, together with the grooming of younger players for positions in senior teams, resulted in the Club becoming highly respected in baseball circles. Players who represented the Club in the late 1940's included: J. Bowes, R. Chipper, G. Cox, T. Crammer, C .Curwood, L. Eggleston, T .Evans, E. Hamilton, L. Hart, R. Higginbotham, G. Jeffs, R. Johnson, L. Lockwood, K. Lovitt, W. McGillvray, J. McKenzie, R. McLeod, D. Miller, M. Morgan, J. O'Brien, P. O'Brien, G. Parr, L. Pittard, V .Rowe, J. Smale, D. Smith, W. Staff, B. Stone, C. Taylor, M. Wallace, R. Wildy, J. Whyte and R. Yeoman. The 1950's proved to be a very successful era in the history of the Club. Premierships were won by the A Grade team in 1953 and 1957, the B Grade in 1957-58, and the C Grade in 1959. In A Grade, Imperials, Saints and Cheltenham consistently provided all teams with strong opposition and Frankston's encounters with such teams generally resulted in matches being of a very high standard. The Club gradually diversified its activities with visits to other clubs, for example, matches at Ballarat against the Wendouree Club. Such inter-club visits, combined with Victorian Provincial Baseball League carnivals at Ballarat, Bendigo, Geelong and Wangaratta provided players with invaluable experience. The social side of these visits was never overlooked and club members enjoyed themselves at a variety of organised and impromptu activities. Apart from premiership wins, Frankston A's were runners-up in 1950 (minor premiers for that year), 1951 and 1958, when Cheltenham defeated them 3/1 in a very tight final. As a measure of their overall strength, the Frankston A Grade team competed in every finals series in the 1950's, with the exception of 1955. The result of having both the A and B Grade teams in the grand finals of 1958 prompted the Frankston 'Standard' 27 August, 1958 to make the following comment: 'It is a credit to the Club that it is able to produce players of high standard year after year, and it is hoped that a third side can be formed next year.' A third side, the C Grade, was entered in 1959 and performed magnificently for the entire season. In the semi-final they annihilated Chelsea 21/1, defeated Saints 10/1 in the preliminary final, and proved far superior to Cheltenham in the grand final by winning 15/3. Apart from excellent fielding and pitching from Joffre Metcher, their batting - 46 runs to 5 in the three finals matches - was simply outstanding. In addition to having strong local talent, the Club acquired the services of such players as Alf Burridge and Joffre Metcher (both ex-Collingwood), Cliff Carter and Clarrie Curwood (both ex-Footscray), Geoff Hawker (originally from WA) and Geoff Drough (Ballarat). William O'Brien retired as President in 1953 and Alf Burridge provided very capable leadership for the next four years. During the 1950's, A and B Grade matches were played at the Cranbourne Road ground with Jubilee Park and Bruce Park as extra grounds for C Grade matches. The Dandenong Baseball Association's affiliation fee was today's equivalent of $6.30, whilst the ground rental was $10.50. 1995 charges for these fees are in excess of one thousand dollars! Transport in those days was a big problem, particularly for away games. Rod McClelland has vivid memories of many team members being transported in Clarrie Curwood's truck or in Len Eggleston's utility. No details are available as to what happened when it rained! Social matches were played in 1956 against the Diamond Valley and Greensborough Clubs. Players who represented the Club in the 1950's included: B. Abbott, M. Barker, I. Beadel, D. Beardsmore, D. Beckwith, J. Bell, K. Black, P. Botsman, M. Brown, C. Curwood, C. Davis, G. Drough, W. Fletcher, A. Hardstone, B. Harvey, J. Harvey, G. Hawker, R. Higginbotham, L. Hyde, B. Jack, I. James, G. Jeffs, L. Jondahl, G. Keileg, I. Leyshan, R. Mackie, I. McClelland, R. McClelland, S. McClelland, O. Metcher, B. Nichols, J. O'Brien, P. O'Brien, D. O'Neill, D. Perry, J. Rogerson, T. Ryan, J. Saleeba, G. Seabrook, J. Smale, W. Souter, S. Stack, G. Stewart, E. Taylor, G. Wheeler and H. Wilcox. The Club rebuilt its squad of players in the late 1950's and early 1960's. Players such as Geoff Drough, Mick Fletcher, Paul O'Brien, Geoff Hawker, Graeme Seabrook, Peter Leake, and Cliff Davis, either retired or left the Club. A new group of players including Jim Saleeba, Bruce and Jim Harvey, Keith Bettles, Les Hyde, Gordon Morton, and Ian Beadel, joined 'veterans' Rod McClelland and Gordon Jeffs to form the foundation of yet another powerful team. In 1962 the Club's policy of developing younger players was vindicated when the A Grade team won the grand final 8/4 against Saints at Bonbeach. In the same year, the Association established an Under 16 competition. Frankston's junior players displayed considerable maturity and determination in winning consecutive premierships in 1964-65. Apart from the A Grade and Under 16's, no other premierships were achieved, however, the A's were runners-up to the Saints in 1963, C Grade in 1969 against Noble Park, and the Under 16's in 1969 against Cheltenham. Clarrie Curwood, a veteran of many games for Frankston and the Dandenong Baseball Association, left the Club in 1961 to develop the St Chads Club at Bonbeach. Joffre Metcher also left to assist him. Club Coaches in the 60's were Joffre Metcher, John O'Brien, Rod McClelland, Norm Wells and Ray Chapple. Club Presidents were John Smale, Paul O'Brien, John O'Brien and Frank Hill. John O'Brien, after outstanding service as Secretary from 1948-61, retired to assist Rod McClelland in coaching duties. He later occupied the position of President in 1966-67. The 60's will be remembered for some very interesting social activities, in particular when Ray Chapple was Coach. Ray, in company with quite a few other members of the team, really enjoyed a few cleansing ales after a game. As a 6.00 p.m. restriction on the sale of alcohol applied in those days, curtains in the club rooms were hastily drawn during social functions, and 'lookouts' placed on guard. The tension was usually broken with the arrival of a certain member of the A Grade team on his way home from work as a member of the Police Force. This particular member, never one to let a chance for a few ales to go by, would arrive in his official van, blue lights flashing, and charge through the front door. His entrance was, to say the least, dramatic, and many ales were consumed in order to return one's nerves to an acceptable level! On another occasion, a barbecue at Brian Jack's nursery in Seaford was invaded by a gang of drunken youths. Such individuals stretched their luck just a wee bit too far when they sampled the team's 'supplies'. After baseball bats were produced, the invaders decided that their luck was about to run out so they left and 'gate-crashed' a netball party down the road! Brian Jack was a colorful character but he had one intense dislike - cats! When the male members of the cat family were crooning sweet nothings to their lady friends, Brian would fetch his trusty slug gun and, according to Denis Beaumont, all hell would break loose! For many players the end of season trip away coincided with a three day lightning premiership at country centres. This event became an endurance test for many players as the off-field activities usually resulted in the Club struggling to field a team on the final day! In order to combine the best of both worlds - baseball and socialising - the Club visited Bairnsdale for a lightning premiership prior to the start of the 1968 season, and to Wangaratta after the season had concluded. The Club's Annual Report of 1968 regarded these visits of some significance and reported the following: 'The Frankston Baseball Club will long be remembered for their efforts in these two country centres.' Further investigation of the participant's 'efforts' was not considered appropriate. Suffice to say that our lads really enjoyed themselves! An incident from the 1963 grand final between Frankston and Saints is worth mentioning mainly because it concerned the decision-making of an umpire. Rod McClelland recalls being 'flattened' by Fred Rogers at 2nd base. In the 'get-together' that followed, Rod, Les Hyde, Fred Rogers, Ian Beadel, and a few Saints players were sent off by the main umpire, Don Armstrong. This exodus resulted in insufficient players being available for the game to continue. After the umpire was gently advised by Rod of his error, the umpire consulted with the other umpires and the 'offenders' were allowed to return. Crowd participation at this stage reached its peak and the noise was deafening. Les, Rod, Fred and a few others were subsequently reported. Rod declined the opportunity to attend the tribunal and received a four week 'enforced holiday'. Les Hyde duly attended and rumour has it that he was 'given the benefit of the doubt', a decision that Rod found somewhat mind-boggling! Players who represented the Club in the 1960's included: B. Abbott, R. Abbott, P. Adams, A. Addicott, G. Allisey, C. Atkins, I. Baker, M. Barker, D. Beaumont, K. Bettles, K. Black, R. Bragg, T. Burns, W. Burns, R. Chapple, C. Chipperfield, J. Chipperfield, R. Calder, P. Clark, G. Coates, I. Cocking, P. Connacher, P. Cooper, B. Crabtree, L. Day, J. De Vos, G. Dicketts, J. Dray, R. Dungan, C. Eastwood, P. Fancke, C. Ferguson, R. Ferguson, A. Forbes, P. Gaylor, P. Gloury, N. Gutteridge, B. Harvey, J. Harvey, R. Harwood, F. Hill, L. Hyde, B. Jack, L. Jondahl, P. Jupp, B. Lee, K. Leveson, D. Leyshan, C. McClelland, R. McClelland, M. McRoberts, G. Morton, J. O'Brien, M. O'Brien, W. O'Brien, P. Reid, B. Renwick, J. Richards, P. Richards, G. Richardson, B. Rickets, L. Ruddock, J. Saleeba, E. Santvoort, F. Santvoort, I. Sigmont, R. Teschendorff, N. Wells, R. Wells, N. Welsh, G. Wilkens and F. Womersley. In 1961, John O'Brien was elected the first Life Member of the Club. Such an award was thoroughly deserving considering John's outstanding service as a player, coach, captain and administrator. The 1970's was an era that saw Cheltenham a very strong club in terms of premiership wins (7 in A,B and C Grades), Noble Park won flags in the 'even' years of '72,'74 and '76, and Bonbeach finally won its first A Grade flag by defeating Frankston in the grand final of 1978. In 1971 the Association introduced the first Pee Wee League (won in its first year by Frankston). Lyndale joined the Association in 1970 whilst Dandenong A disbanded in 1971. Sporting clubs invariably encounter problems that manifest themselves in many areas of a club's operations. In 1971 when Club administrators took drastic action against the behaviour of some junior players, the all-important atmosphere at the club was seriously impaired. As a consequence, on-field performances suffered and, as a result of minimal social activities, the Club experienced financial problems. A large number of players resigned in 1972 with the result that there were insufficient numbers of senior players for the various teams. Junior players had their careers 'accelerated', and finally the Club was relegated to B Grade from 1973 until 1975. There is no doubt that the events of 1971/72 had a highly undesirable effect on the overall development of the Club. Although the Club recovered, subsequent administrators have been fully aware of the fact that whilst disagreements do occur in clubs from time to time, their resolution requires speedy action before 'divisions' are established. In a highly positive step, Club officials embarked on a long-overdue recruiting campaign with the result that players gradually became attracted to the Club. The B Grade team, the only team entered in senior competition, was runner-up in 1970 and 1973, whilst the Under 15's finally achieved their first premiership win in 1973. With the exception of 1972 and 1976, finals appearances for the remainder of the 70's were minimal, apart from the all-conquering B Grade premiership of 1975, the A Grade (reinstated in A Grade in 1976) who were runners-up to Bonbeach in 1978, the Under 15's runners-up to Bonbeach in 1970, and the Under 17's who were finalists in 1977 and 1979. Club Presidents during the 1970's were Ray Chapple, Rod McClelland and Mick O'Shea. In 1976, Mark O'Brien was elected as President, a position he has held to this day. Peter Finney, Graham Pill and Mark O'Brien were Club Coaches. 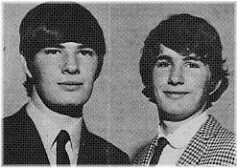 Two members of the Club were inducted as Life Members - Rod McClelland in 1971, and Paul O'Brien in 1977. Rod Rod McClelland joined the Club in 1950 when his family moved from Queensland in 1949. A former junior rugby player, Rod quickly adopted the baseball code and as a result of his enthusiasm and competitiveness, played a major role in Frankston winning premierships in 1953, 1957 and 1962. His contribution to the Club was invaluable as over the years he occupied the positions of Team Captain, Senior and Junior Coach, and Club President. He was a player readily suited as a second baseman and he was a very capable batter. Paul O'Brien commenced at the Club in 1949. He successfully combined the duties of a committee member - President and Treasurer - with the on-field responsibilities of player, Team Captain and Club Coach. Paul will long be remembered for his contribution to the Club winning the 1953 and 1957 premierships, in particular the 1957 grand final when he gave an inspirational address to his players before the game. As a junior coach, his influence was considerable and many past and present senior players were indeed fortunate to have Paul as their coach in their formative years. The Under 13 team of 1976 had an exceptional year, being runners-up for the season despite a two week disqualification by the Dandenong Baseball Association Junior Executive. It was discovered by Association officials that one member of the team was ineligible to play because his date of birth exceeded Association regulations. Whilst Club officials would normally have accepted such a ruling as being an oversight on their part, in this particular case they were furious as they did not receive the Association notice advising them of a change in policy regarding the age limits of players. Despite varied Club protests, the team suffered the following 'penalties': 1. Points were deducted. 2. The entire team was suspended for two matches. Understandably, the Club was not pleased with such harsh 'penalties' being imposed on a team whose only concern was playing the game. The Under 17's were also involved in a controversial decision towards the end of the 1976 season. This time it concerned the '5 minute rule' that is, an innings cannot be started with less than 5 minutes to go. Unfortunately, though the Club felt the decision given was the correct one, it did place undue pressure on the team. With a finals berth at stake, both teams had to go back to Cheltenham the following week to play the final innings. Frankston lost the protest innings thereby placing the team just 2 points outside the final four. Despite their disappointment, the team showed great sportsmanship after the match had concluded. Sue Nicoloau (nee Gloury) was elected as Secretary in 1977, a position she held until 1991. Efficient and enthusiastic, Sue carried out her wide-ranging duties extremely well and provided invaluable support to Mark O'Brien as President and to other members of the Committee. The Club entered 3 teams - A, B and C Grade - for the 1978 season, the first time this had happened for many years. With the exception of the C Grade - who missed out playing in the finals by one game - the A and B Grade teams made it through to the finals. Lou Postlethwaite, a naturally gifted ball player, Victorian representative and Australian All Star, became the first Frankston player in 1977 to win the 'O'Brien Medal' for the best player in A Grade. Players at the Club during the 1970's included: P. Adlington, G. Allisey, M. Ames, N. Baxter, D. Beaumont, R. Bechaz, L. Brackley, K. Bray, M. Bullock, T. Burns, W. Burns, G. Canning, R. Chapple, C. Chipperfield, P. Chipperfield, D. Corney, G. Court, B. Crabtree, N. Crabtree, L. Crang, A. Crouch, J. Davis, W. Davis, B. Dodson, J. Dray, C. Ferguson, R. Ferguson, P. Finney, P. Garner, P. Gillard, P. Gloury, R. Griffin, R. Griffiths, I. Hatch, T. Halls, B. Hura, N. Killian, M. Lacy, G. Legge, C. Love, D. Love, T. Lovell, D. Mackie, W. Maher, C. McClelland, R. McClelland, J. McComb, P. McGrath, L. O'Brien, M. O'Brien, W. O'Brien, M. O'Shea, J. Osmond, G. Perry, L. Postlethwaite, P. Richards, L. Ruddock, F. Santvoort, W. Saunders, I. Sigmont, N. Shepherd, W. Stradher, R. Teschendorff, N. Wells, R. Wells, N. Welsh and I. Wilson. The Club won senior premierships in 1988 (A Grade) and in 1984 (A Reserve), and were runners-up in C Grade in 1982-83, and A Reserve in 1987. At the junior level, premierships were won by the Under 17's in 1983, the Under 15's in 1982 and 1987, and the Under 13's in 1980. The juniors continued their amazing run of grand final appearances by being runners-up ten times - Under 17's in 1980-81, '82, '84 and '86, the Under 15's in 1980-81 and '86, and the Under 13's in 1981 and '83. Monash University dominated the A Grade competition by winning six consecutive premierships between 1980 and 1985. Such a record currently appears to be in no danger of being equalled let alone eclipsed. The A Reserve team of 1984 lost only two games for the season and showed tremendous determination to recover from 0/2 in the 9th innings to defeat Cheltenham 3/2. Andrew Purchase capped off a great year for the team by winning the DBA Best Player in the A Reserve section. In winning this medal Andrew became the only player in Club history to have won this award and been a member of that year's premiership team. A further honour was bestowed upon the Club when it was awarded the 'Neil Pendock Trophy' for the Champion Club in 1984, under Club Coach Chris Love. The A Grade win of 1988 is now part of Dandenong Baseball Association and Club history when Frankston and Bonbeach played the first tie in a grand final. Frankston won the replay 13/3 the following week. Additional DBA Best Player winners for this period were Murray Holmes (A Grade 1989 - O'Brien Medal), Neville Knight (B Grade 1988), and Luke O'Brien (C Grade 1983). Club Coaches during the 1980's were Mark O'Brien, Chris Love, Murray Holmes, David Simpson, Daryl Dicker, and Michael Klinger, a former veteran of many Claxton Shield carnivals. In 1981 Mark O'Brien became the 5th Life Member of the Club. Mark's involvement in all areas of the Club - senior and junior player at Club, Victorian Provincial Baseball League, Dandenong Baseball Association and Australian junior levels of competition, Senior and Junior Coach, Secretary and President of the Club and Association more than justified him receiving this prestigious award. Off the field, two important changes in the Club's operations took place. Firstly, in 1985 the Club obtained legal status particularly as far as financial matters were concerned, when it became incorporated. Secondly, a Restricted Club Permit was obtained to allow the Club to sell alcohol. The Dandenong Baseball Association recorded 14 carnival championships during the 1980's. Frankston had representatives in all winning teams - Seniors, Colts, and Under age levels - some of which were multiple winners. It was indeed a highly successful decade for the Association at Victorian Provincial Baseball League level, and of course the Frankston Club. Unfortunately the only Association team to win a premiership in 1988 - the 50th Anniversary of the Victorian Provincial Baseball League - was the Under 17's at the Ballarat Carnival. This team went through the championships undefeated thereby winning the first Under 17 championship since 1982. The batting ability of this team was quite remarkable inthat they scored 81 runs to the opposition's 15! Frankston representatives were Gareth Finney, David Jones and Shannon Whitehead. The Coach and Assistant Coach of this prestigious line-up were none other than those two colorful characters, Peter Gloury and Andrew Jones. The C Grade competition of 1983 was particularly interesting. In fact, it could very well have been unique. The C1 team, captained by Denis Beaumont, with Michele Winther as Scorer, was comprised of the following players - M. Barker, D. Beaumont, R. Cheesman, J. Ferron, G. Gibney, P. Gillard, M. Lane, M. Liddell, P. Ringer, F. Scalzo, R. Smith, G. Wells and N. Winther. The C2 team, capably managed by Luke O'Brien, was affectionately known as the 'C Drunks', a label that quickly evaporated when they took the field. Despite being entered five weeks late into the competition, this collection of 'fluorescent fireballs' managed to finish the season in third position. The team comprised D. Archer, M. Bullock, R. Gates, P. Garner, T. Halls, A. Horne, A. Neal, L. O'Brien, M. O'Shea, J. Perry, J. Prokhovnik and S. Ross. Unfortunately, the best laid plans of having an all-Frankston grand final went sadly astray, despite the fact that both teams won their semi-final matches. C1 defeated Cerberus 3/1 whilst C2 had a good win over Dandenong 7/3. In the preliminary final Luke O'Brien's team narrowly lost to Cerberus 10/7 whilst in the grand final Denis Beaumont's team were convincingly defeated by the lads from HMAS Cerberus. Denis recalls that Cerberus 'recruited' a 'gun' pitcher and the rest is history. There is no doubt that being a member of either of these teams would have been an experience and it is a credit to both 'skippers' that law and order was maintained throughout the season. Well, almost. Players at the Club during the 80's included: P. Adlington, J. Ahern, M. Anderton, S. Ashley, D. Beaumont, S. Beaumont, M. Bullock, D. Burley, R. Cheesman, A. Clarke, P. Cooper, D. Corney, G. Court, L. Crang, D. Dicker, G. Evans, J. Ferron, G. Finney, P. Garner, G. Gibney, P. Gillard, P. Gloury, J. Gulbin, T. Halls, P. Hamilton, R. Hogan, M. Holmes, B. Hura, A. Jones, N. Jones, M. Klinger, J. Lancaster, M. Lane, M. Liddel, C. Love, P. McGrath, Daniel O'Brien, Dominic O'Brien, L. O'Brien, M. O'Brien, T. O'Brien, W. O'Brien, M. O'Shea, I. Pollard, J. Prokhovnik, A. Purchase, S. Purchase, A. Richards, P. Ringer, M. Saleeba, N. Saleeba, S. Schneider, D. Shanahan, D. Simpson, H. Simpson, P. Stevens, P. Tardiff, T. Totaro, G. Ulmer, G. Perry, D. Jones, S. McClelland, A. Neal, F. Scalzo, D. Walker, L. Walters, G. Wells, M. Wells, R. Wells, P. Weston, S. Whitehead, N. Winther and S. Womersley. Before proceeding with a outline of the events and activities of people connected with the Club during the past six years, it is appropriate that some consideration be given to a constant factor in our daily lives - change. Change for many people can be quite a problem in that it can be threatening and result in a variety of problems for an individual and/or an organisation. On the other hand, there are those people who respond positively to various changes - they realise that there is a need for change, develop an interest in the proposed change, plan their strategies, and subsequently adopt whatever is proposed. Whilst the Club has been fortunate in retaining many senior players and supporters, invariably the time will come when such players and supporters will either retire or become involved in other recreational and sporting pursuits. Perhaps the time has arrived whereby the Club may need to allocate time to plan for the future. The 90's has seen the Club maintain its competitive attitude in the senior and junior divisions of the Dandenong Baseball Association competition. Premierships have been restricted to the A Grade in 1991 (its fifth), the first D Grade in 1990 and in the 50th year the first for the Under 12's. The A's were runners-up in 1990 and 1994, the B's and C's regular finalists, whilst the Under 12's and 14's were runners-up in 1994 and the Under 18's also runners-up in 1990 and 1994. Bonbeach, arguably Frankston's fiercest rival, won their first A Grade pennant in 1979 but since then have three more in 1990-92-94. In the junior divisions Dandenong and Bonbeach have so far dominated the competition. At the Victorian Provincial Baseball League level, the Dandenong Baseball Association seniors achieved a 'hat trick' of premierships in 1990-1992, whilst the Under 14's, 16's and 18's recorded premierships in 1990, 1991 and 1993. Frankston players were well represented in all of these teams. Daryl Dicker and Leigh Walters were the Association Batting Champions in 1992 and 1994, whilst Daryl showed his eyesight was operating efficiently by winning the 'Home Run King' Award for the 1992 season. Other award winners were David Simpson who achieved an ERA rating of 1.29 in 1991, whilst Floyd Selleck in 1991, achieved 10 victories as a result of highly 'variable' pitching. Club Coaches so far have been Daryl Dicker, Damian Shanahan, Chris Love and Mark Anderton. Michele Winther took over as Club Secretary from Sue Nicolaou in 1991. Since 1994 Tee-ball has gained considerable momentum with over 60 youngsters and their parents involved in activities on a Sunday morning. It is to be hoped that many of these youngsters will progress through the junior ranks and become the senior players of tomorrow. As the 50th Anniversary Year, 1995 has had a special significance. A Luncheon was held at the Club on 25 June and was a great success, the 'recollections' of Rod McClelland, John Crichton and John O'Brien were not only interesting but highly entertaining. The Anniversary Dinner on 5 August at the Frankston RSL and the 'Old Buffers Match' on 27 August (see picture at right of John Crichton) were equally successful in celebrating the Club's 'Golden Jubilee'. 1995 saw the A Grade once again playing in the finals but the expectation of a flag in the 50th year did not come about with the team going down in the first semi final to the eventual premiers Berwick. Players at the Club during the 90's have included: P. Adlington, M. Allanson, C. Anderton, M. Anderton, R. Anderton, V. Ardley, S. Beaumont, M. Bowra, R. Brooks, A. Brown, D. Bucca, G. Cininas, G. Clapham, R. Clarke, P. Conell, G. Court, C. Cox, F. Darragh, G. Davis, R. Davis, D. Dicker, G. Douglas, P. Duncan, P. Dunn, S. Ellis, G. Evans, J. Farrell, M. Faulkner, G. Finney, T. Floro, S. Fountain, P. Gloury, T. Goodrich, M. Greasley, T. Hanson, R. Hogan, M. Holmes, G. Hunt, B. Hura, A. Jones, D. Jones, M. Klinger, J. Lancaster, M. Leo, C. Love, O. Malone, P. McGrath, R. Mildenhall, C. Myles, S. Myles, J. Nigri, M. O'Brien, W. O'Brien, P. O'Connor, G. Owens, A. Purchase, S. Purchase, A. Richards, M. Saleeba, N. Saleeba, S. Schneider, D. Scott, F. Selleck, I. Sigmont, D. Simpson, D. Stephens, L. Walters, D. Watson, T. Watson, M. Watts, M. Wells, S. Whitehead and N. Winther.